Giant Sparrow's The Unfinished Swan turned a lot of heads at E3 this year as yet another one of those artsy experiences designed to counter balance the blood-lust that surrounds AAA gaming these days. Flower, Journey, Pixeljunk Eden; these hypnotic games are part of an ever growing trend designed to challenge gamers' imaginations, something much richer and deeper than skill at mowing down faceless enemies. As games grow more and more detailed and lifelike, the population's ability to fill in the gaps and use their minds to expand a game dwindles with each linear corridor shooter. The Unfinished Swan is here to help, giving gamers the chance to find their own fun in this deceptively shallow first-person puzzle adventure. The Unfinished Swan tells the story of Monroe, a young boy sent to an orphanage after the death of his mother. 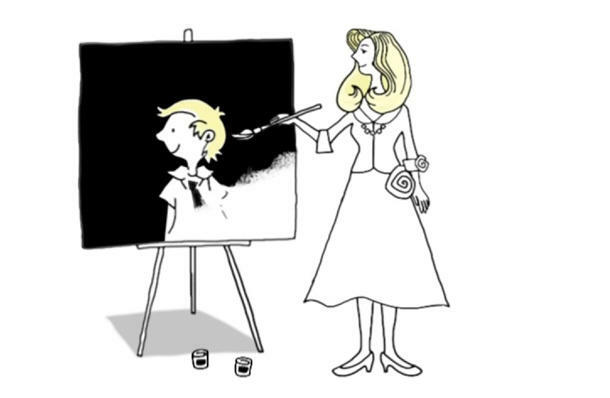 He is only allowed to keep one of his mother's paintings from the hundreds she left incomplete throughout her lifetime, and Monroe chooses his mother favorite, the painting of an unfinished swan. After falling asleep one night, the confused boy finds himself totally surrounded by white with nothing but the swan guiding him through the life story of an arrogant king, more occupied with his artistic abilities rather than the happiness of his people. That's all there is to it, really. Gamers have poured over this simple narrative looking for a deeper meaning for the sake of stroking that pretentious tendency we have towards our beloved medium, but sadly these people are missing the point. The Unfinished Swan has no deeper meaning, no hidden context about growing up, and certainly doesn't hold the secrets of life. It's a child's fairy tale, a bedtime story used to overwork the child's imagination and ultimately lull them to sleep. Not that there's anything wrong with simplicity. The Unfinished Swan's tale is more alluring thanks to the undefinable sense of wonder. Bright images and gentle music backdrop the narrators motherly voice telling the tale of the king. Much like most Terry Gilliam scripts and films, it's not about the ultimate destination or the hidden meanings, but rather a constant lingering desire to tickle and tease the imagination about what will happen next, resulting in a far more rewarding experience than a string of thinly connected NES references or yet another predictable world crisis being thwarted on multiple battlefronts. The Unfinished Swan's tale is more alluring thanks to the undefinable sense of wonder. A simple story meets simple mechanics. Much like the story, the gameplay's payoffs are also sweet and simple, rewarding gamers with small clever changes to the bare bones game mechanics. The Unfinished Swan was kind of misrepresented as a game where a faceless being throws balls of paint at white backgrounds to the path to the level's end. The first level does revolve around this idea, but each of the game's other three chapter do change up the formula. You'll use water balloons to spread a vine to previously unreachable areas or navigate a pitch black nightmare with nothing but the aid of slowly dimming neon lights. While simple in its layouts and puzzles, the game does provide a fun treasure hunt for those who need more than a simple run-through to feel they are getting their money's worth. 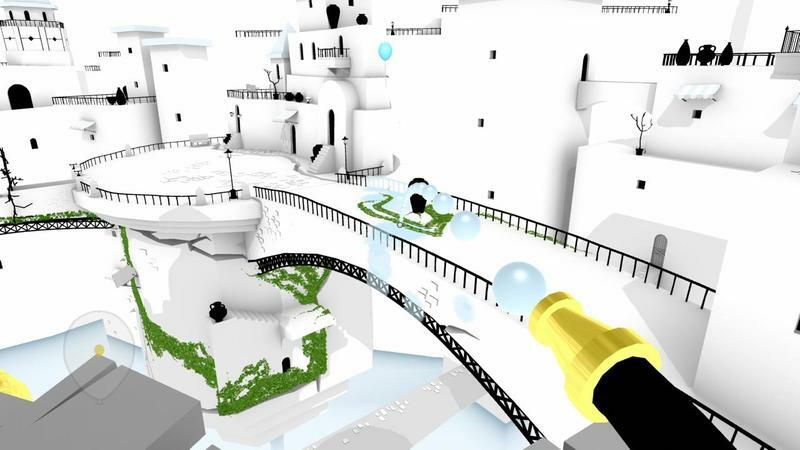 Scattered throughout each level are balloons, hidden in the white backgrounds and black shadows. Finding these balloons unlocks fun little goodies like a paint hose or a sniper rifle to spread the paint on even thicker. They do absolutely nothing to help with the game's objectives, but they do provide a toy box of fun alternatives to playing around within the game's campaign. And that's just what The Unfinished Swan is. Obsessive gamers who struggle to find every secret and unlock every trophy will be at odds with how little The Unfinished Swan provides. However, it does not intend to be anything else and doesn't really pretend to be either. It's a game for those who prefer to experience their titles rather than beat them. It's a game for those who want to find their own ways to have fun, not to have fun spelled out for them in a complicated tutorial. Remember the joy of playing cowboys and Indians with your friends in the backyard? With very little provided, your imagination filled in the blanks and your afternoon was complete. The Unfinished Swan is only two hours long at most, but there is plenty more to find here for those willing to dig in and tinker around. The question has come up as to how this holds against thatgamecompany's PSN hit Journey, released earlier this year. If it came down between the two, I would have to fall on Journey's side of the fence, but mostly because I am much more fond of third-person than I am of the first-person perspective. Journey provides a bit more for your money, but luckily, you live in a world where it's not illegal to buy both, so why bother limiting yourself? Pick up both while you're in the shopping mood. We purchased our copy of The Unfinished Swan on the PSN with company funds. We completed the game before starting this review.